The role that typography plays in the success of a Web design (and of course to the user experience) is indisputable – if I never, ever see Comic Sans again it will be too soon. Website Magazine has covered a few different tools over the years to help designers identify fonts they may be interested in using, most recently Fount, but there’s always room for one more, right? 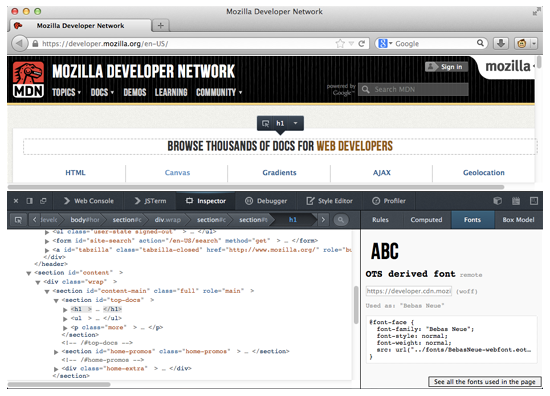 Mozilla has included a new font-related tool called the Font Inspector (see image below) to its Firefox Dev Tools. While currently only available in the browser’s nightly build (meaning it’s only in the pre-beta stages now), it does indicate that the popular open-source browser maker’s developers are certainly tuned in to the challenges of modern Web design. The tool essentially enables designers to see what Web fonts and font-based icons are being used in a page (including the font name and font family, its location, a preview and the @font-face code) – providing yet another opportunity to see different approaches to typography in action. - Typekit of Google Web Fonts?